After we learn how to say hello and greet now it is time to start some basic conversations. is an information-seeking question particle used in neutral questions which do not anticipate either a positive or negative response. Subject + adjective or verb + mái ? question: bprá-têet tai rôrn mái? If the question includes more than one verb, the first verb is normally used in responses. Question:yàak bpai duu năng mái? Would you like to go to see a movie? – หรือ /rŭe/ is obsolete, no one is using this one as a question word anymore. It is used for ‘or’. Yes you can start the sentence with a verb. The question you formed is very good, I would correct only one thing which is the question word – it should be “มั้ย /mái/?” –> Chɔppin thii pratheet yiipun sanuk mai kha? 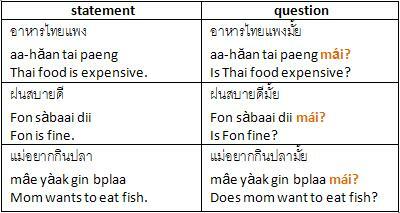 I will answer to the question like this: yes: เป็นคะ (bpen ka) or no: ไม่ใช่คะ (mâi châi ka). Is it right? In my opinion, when you answer “yes”, you’d better say ใช่ค่ะ. I have a question that is how to say “Is she a teacher?” in Thai. Sawatdee ka, it is “เขาเป็นครูรึเปล่า” kao bpen kruu rue-bplaao? 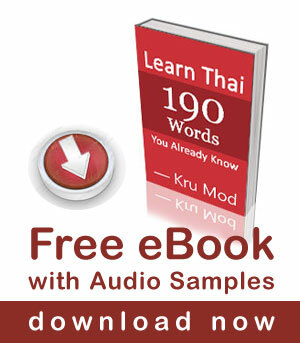 Hi , would you please help me , I want to learn thai language . The writing ” มั้ย” (Mai) and the “ไหม” are the same na krup. The question word used to form Yes/No question “mái” (high tone), to put it in writing it is “ไหม” (măi – writing language) but it is pronounced as “มั้ย” (mái -speaking language). When I made my video I was afraid that the audience would be confused if it should be rising tone or high tone, so I decided to write it as the way it is pronounced which is high tone มั้ย. But later when I wrote the blog I thought I better write in Thai script in writing language ไหม. That’s why they are different. To make it easy to understand, when you speak you say mái (มั้ย) but when you write it, write ไหม (măi) . hi ,its gud that i learning more about thai language,so as i got more knowledge for yes /no question,..in the last video a question been asked by mod ,and the answer is yes,so mod can u plz tel me how to wright the yes in thai language,,the quetion was,,,wi-dioo-ssa-nuk-mai? The yes answer to “mai?” question is repeating the verb/adjective from the question.